What is the difference between Click-to-call and ClickCall™ from PRINT2D? ClickCall™ is a mobile Web enabled callback solution that lets users schedule a callback at the time they choose. ClickCall™ enhances customer service while reducing dead leads. ClickCall™ resides on a mobile landing page and sends information directly to your email and phone. ClickCall™ is a trackable call-to-action. Full analytics are available. 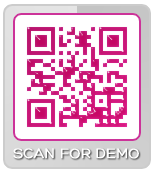 Scan the code to demo ClickCall™, live, M - F (9am to 5pm) PST.